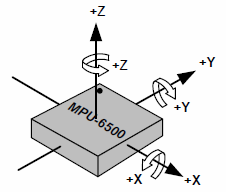 The IMU's axes are defined in the datasheet by the following diagram. Note that the axes are referenced to the pin 1 indicator, shown as a dot on the above image. Now that you know how the axes are oriented, you need to know how the device is oriented on the Shoto HDK. The image below shows the bottom side of the Shoto core module with the location of pin 1 of the IMU indicated.